Many of the French composers in fin-de-siècle France were drawn to composing music to accompany the works of the poets of their day, particularly the symbolist poets. One such composer was Nadia Boulanger (1887-1979) who is better known today as the influential music teacher for many of the leading composers and musicians of the twentieth century such as Aaron Copland, Dinu Lipatti and Philip Glass. Nadia Boulanger started her career as a composer but ceased composing music around 1922 at the age of 35 years. Born into a family of musicians, her predilection for song composition no doubt came from the influence of her father, Ernest (1815-1900), opera composer, orchestra conductor and teacher of singing at the Paris Conservatoire. Many reasons may have contributed to her decision to cease composing. Of interest to this author is that five songs, based on poems by Camille Mauclair (1872-1945) are amongst the last of Boulanger's compositions. Mauclair, writer, poet, essayist, biographer and literary, music and art critic was a member of the Belle-Époque Parisian artistic scene. His poetry, imbued with musicality, was mostly of a sombre ambiance, dealing with the vicissitudes of love. 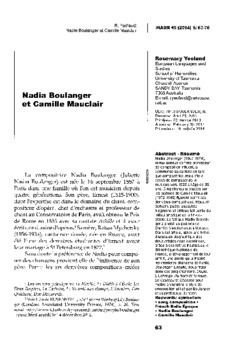 The fact that Nadia Boulanger chose his poems at the end of her composing career prompted the writing of this article. Unpublished letters deposited by Boulanger at the Bibliothèque Nationale de France indicate that she and Mauclair already knew each other at the time of Raoul Pugno's death in 1914. Pugno had been a very close friend and working associate of Nadia and she had asked Mauclair to write a eulogistic article on the musician. The subsequent unpublished letters sketchily reveal the development of their friendship which resulted in the composing of the songs Doute, L'Échange, Au bord de la route, Le Couteau and Chanson taken from Mauclair's collection of poems entitled Le Sang parle. In my article, I begin with a brief biographical discussion of the earlier years of both Boulanger and Mauclair prior to their friendship. I then examine the progress of their relationship according to the letters. Each of the above songs are then discussed in detail, establishing the mood Nadia Boulanger achieves musically by her choice of tonality, rhythm and expression.